Soak chicken in wine, thyme, and garlic overnight in a covered glass dish or bowl. Make sure chicken is turned a couple of times during the soaking process. On the stovetop on medium heat ,In a large pan, melt butter, and add the bacon. Cook until all brown and yummy. Add shallots and carrots. Cook for 5 min. Sprinkle with flour and stir for 2 minutes. Add tomato paste and chicken stock. Separate chicken and wine marinade. Stir wine marinade into pan with other ingredients and bring to a boil. Add mushrooms, cook for 5 minutes. Add chicken, cover and move into oven. Cook for 25 minutes. Turn chicken and cook for 25 more minutes. Serve hot with crunchy bread and butter and a nice fresh green salad. 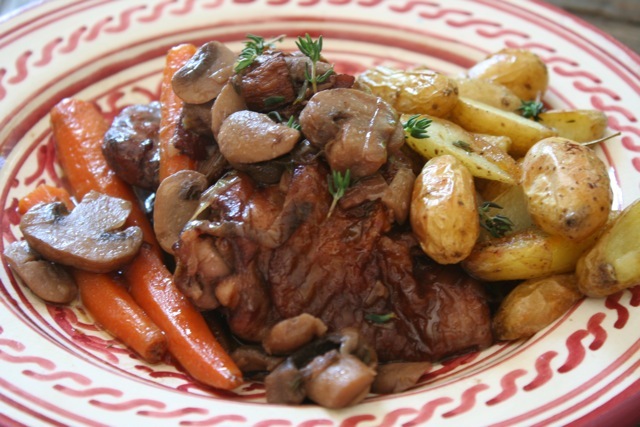 This entry was posted on Sunday, October 2nd, 2011 at 11:21 pm	and tagged with braised chicken, carrot, coq au vin, dinner, French, recipe, roasted potato, stew, supper and posted in Category. You can follow any responses to this entry through the RSS 2.0 feed.